Friday the 13th | WHAT A FEELING! Jason, the socially maladjusted slasher of the Friday the 13th series, has been stuck in the small town of Crystal Lake for his entire cleaver-hoisting existence. Mind you, Crystal Lake provides an acceptable volume of stupid teenagers for Jason to slice up. But even Jason can dream of new horizons, new challenges. His vagabond shoes are longing to stray. 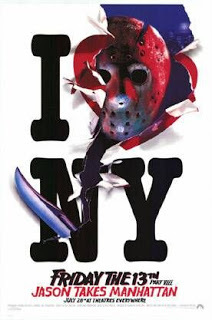 In the eighth installment of the series, Jason’s little-town blues are melting away; he goes uptown in Friday the 13th Part VIII—Jason Takes Manhattan. Yes, the man with the hockey mask gets himself to New York City, where, appropriately enough, he fits right in. The TV commercials that have been incessantly promoting this film over the last couple of weeks have stressed the amusing angle that Jason is nothing unusual in New York. Unfortunately, all the good lines are in the commercials. The movie doesn’t have nearly as much fun with this idea as it should. The ads, and the titles, have been misleading in another way. This film is two-thirds over by the time Jason and the other principals reach New York. The first part of the movie is taken up with a sea cruise, for a high-school graduating class of course, which Jason joins as an unwelcome stowaway. He soon has his hands full: so many teenagers, so little time. Despite the switch in scenery, this outing is one of the series’ worst. Writer-director Rob Hedden blows nearly every opportunity for shipboard terror, and his treatment of the inner-city stuff is standard and unimaginative. The leading lady (or, main target) is Jensen Daggett, who lends a thoughtful presence; she could be at home in true Gothic material. At some point, some Friday the 13th movie is going to have to spoof itself. (Intentionally, that is.) But who knows where Jason will turn up next? He may be off to Rio, Tokyo, or Paris; picture Jason crouched over a croissant at a café on the Left Bank, dreaming of ways to kill the waiter. This boy can thrive anywhere. How did I not end this review with “He’s gonna make it anywhere”? I guess the movie wore me out, as did this dismal series. The intentionally funny one turned out to be Jason X, by the way. The Friday the 13th horror series is one of the most depressing success stories in Hollywood today. Wait a minute—what am I saying? The Friday the 13th series is the most depressing success story in Hollywood. Nothing else really comes close. Last year, Part IV promised that is was The Final Chapter, thus raising hopes among civilized people everywhere that he trashy series was truly at an end. Not so. These films are much too popular; sad to say, the latest entry opens the door for a whole new cycle of movies. The subtitle of Part V announces A New Beginning, wherein the bloody duties of a maniac names Jason are passed on to successors. Jason is a brain-damaged fellow clad in a hockey mask who kills indiscriminately. He’s been doing it since Part I, and he has seemed indestructible heretofore. That’s because, no matter how much punishment he gets, he just keeps going. Okay, he was killed off in Part IV, but somebody seems to be emulating his style in Part V.
Just in case anyone cares (the filmmakers certainly didn’t), the plot happens in a nuthouse—er, a center for social rehabilitation—out in the woods, where the guy who killed Jason in Part IV is sent for therapy. The other inhabitants are freaky guys and nymphomaniacal girls. People start getting hacked up, and it looks like Jason’s method. The formula is so set by now, these “suspense” sequences are all deadly dull: Two people are out alone, and one of them says something like, “Gee, I think I’ll go over into these dark bushes and look around.” At which point both people are attacked and done away with. 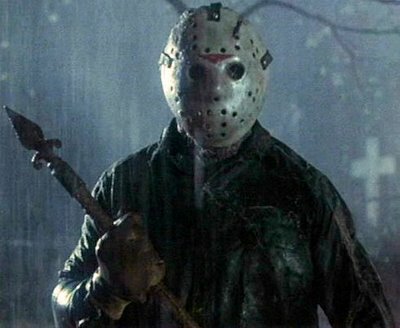 One angry visitor to the rehab center says, “As far as I’m concerned, all these loonies should be killed off one by one.” He probably didn’t know he was describing the plot line for the film—or for any of the Friday the 13th films, for that matter. So it goes. As usual, the people getting killed are so imbecilic you don’t feel too much sympathy when they buy the farm. That, I guess, is the dirtiest aspect of the Friday movies: the utter cynicism with which they are created and produced, with cardboard characters, situations, effects. It’s all done by rote, so you can’t care about anything. These films always raise the hackles of decent folk who speak out on the violence and cruelty of the movies. There is a group that should be even more upset: people (such as myself) who like horror films. The genre has been so devalued in the last decade that it’s become difficult to admit you enjoy horror films of any kind—even when good and inventive work is done within the horror form. So, let’s hope this New Beginning is stillborn. But based on the track record of the Friday movies, don’t bet on it. Looking at the actual release date of this film, I see that it opened a week or so after I quit the last full-time non-writing-related job I ever had, and a few days before leaving for my first trip to Europe. So I was really feeling euphoric, which might explain my reaction to being bummed so hard by this lousy movie. There is absolutely nothing else to say about it. 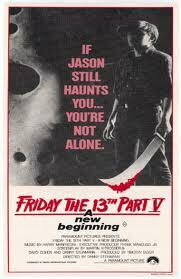 In the early going of Friday the 13th, Part VI: Jason Lives, there are flickers—flickers, mind you—of self-parodying humor. The most outrageous flicker is a parody of the James Bond opening, in which, seen in profile through an iris, 007 shoots at the camera. This time the mad killer of the Friday the 13th sagas, the indestructible Jason, strides across the screen, brandishing his machete. What would Ian Fleming think? Well, yes. Considering that this utterly worthless series of films is clocking in with its sixth installment, and more promised by the he’s-not-quite-dead-yet ending, we can assume that a significant portion of the moviegoing audience does indeed have a strange idea of entertainment. At least writer-director Tom McLoughlin tips his hat to the inexplicable appeal of the series. McLoughlin displays a trifle more wit than the previous interpreters of the formula, which isn’t saying much. Halfway through, even the occasional throwaway gags disappear, as Jason goes on his bloody quest to puree as many campers as he can. As you will recall from the previous installments, ol’ Jason Voorhees, who favors a hockey mask over his decomposed puss, has been killed off a bunch of times. Jason’s dead again at the opening of Part VI, but a stupid teenager (though that’s a redundancy in these films) digs up his grave. There’s Jason, his face crawling with maggots, incontestably dead. This kid may have seen a Dracula movie, because he grabs an iron fencepost and rams it through Jason’s chest. However, the kid has obviously never seen a Frankenstein movie, or else he’d know that the thunderstorm raging above is going to send a bolt of lightning down to hit the iron post, thus reanimating (and considerably peeving) the already-disagreeable Jason. After that, Jason does his thing, much in the manner of an aging vaudevillian running through his familiar routines. Except, of course, that Jason’s routine involves spilling buckets of anonymous campers’ blood. Happily enough—for Jason, that is—he happens upon a machete and a hockey mask, in the course of his forest rambles. That’s all, except that one sleeping camper reads Sartre’s No Exit; the hero calls Jason “maggot-head” when he wants to get his attention; and director McLoughlin once played the mutant grizzly bear in John Frankenheimer’s Prophecy—a performance roughly as important as his authorial work here. First published in the Herald, 1986. I don’t know how many Friday the 13thmovies I reviewed—just around half, probably. They all stink, and they look horrible (when I reviewed a box set for Amazon.com, I was struck by the way the DVDs looked much better than the movies ever had, just by virtue of being crisped up with a digital dusting). The fact that the early-Eighties horror era is now looked back on as a credible period for the genre (and even seen as the good old days for some) is truly bizarre, because at the time, a horror fan was very aware of living through the worst phase of horror-movie history, the first installments of Halloween and A Nightmare on Elm Street very much excepted. You are currently browsing the archives for the Friday the 13th category.